Exploding cane toads have been reported on April 25, 2005, at Lake Mosehullet, Middle Jutland near Laasby in Denmark, northwest of Copenhagen. Originally native to Venezuela, cane toads have poisonous sacs on the back of their heads which can kill crocodiles, snakes and other animals in minutes. Photograph courtesy of USGS. April 27, 2005 Hamburg, Germany – At first, the idea that poisonous cane toads originally from Venezuela, South America would crawl out of a lake near Hamburg, Germany, and explode to death, sounds like a Monty Python comedy. But over five days between April 3 and April 7, 2005, an estimated 1,000 poisonous cane toads did exactly that. This week I talked to Werner Smolnik, the Hamburg, Germany, Project Leader for NABU, the oldest German society for protection of plants and animals. He went to Altona Lake and watched the baffling phenomenon for himself. Several exploded toad carcasses were delivered to local Hamburg city veterinarian, Otto Horst, D.V.M. He told me he had never seen such toad explosions before and confirmed that so far no chemicals, pesticides, bacteria or viruses have been found that might explain the toad explosions. Mr. Smolnik said he was trying to research a rumor that similar cane toad explosions occurred in South America in 2002 to 2003, but neither of us so far have been able to find any news reports. One theory was that horses were transporting a toxic yeast from mushrooms into river and lake water. But Dr. Horst told me he does not think that is the explanation in Hamburg, Germany. Perhaps the exploding cane toads is a deliberate and insidious toxin perpetrated by human revenge? Anywhere the poisonous toads turn up, people begin wanting to kill them. 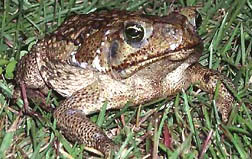 Five months ago on November 4, 2004, David Tollner, a member of the Australian parliament, used his official post to call for the “bashing of poisonous cane toads with cricket bats and golf clubs.” Cane toads were brought to Queensland from Venezuela, South America, in the 1930s to try to control beetles that were destroying sugar cane fields on the northern Australian coasts. But the cane toads, which have poisonous sacs on the back of their heads that can kill crocodiles, snakes and other animals in minutes, spread rapidly and now number in the millions. The Australian Northern Territory government authorized a million dollars to research biotechnological remedies to the toad invasion. 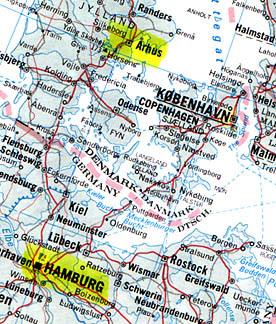 Maybe someone is testing one of the remedies in the German and Denmark waters? 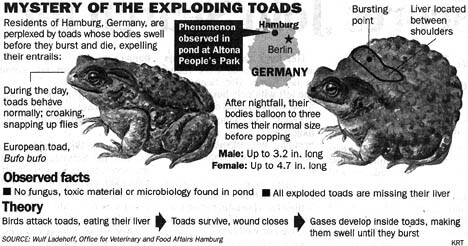 April 29, 2005 – Since my above phone conversations with Mr. Smolnik and Dr. Horst, the German media has been told that all the estimated thousand exploded toads are missing their livers (but only a few have been examined). Further, the theory for the phenomenon now being discussed is that crows are attacking the cane toads, plucking the livers out of the toads’ backs between shoulders, causing the blood vessels and lungs to burst. My question is this: if the back of the cane toad is where its very poisonous sac is positioned with toxin so lethal the cane toad can kill crocodiles, how do crows suddenly know where to pluck out specifically the liver without poisoning themselves? So far, no dead crows have been reported in either Germany or Denmark in association with the exploding toad phenomenon. Information Source: Wulf Ladehoff, Office for Veterinary and Food Affairs, Hamburg, Germany, KRT.